While I admit to having written about The Book That Shall be Unnamed (and, yes, tweeting a link to why it’s bad), I did also try to present alternatives for it this weekend that are easy to do, and some of which actually involve your entire family. I’m small potatoes, though. And I do wish there was more effort into What to Do Instead on the part of Christians. And that the What to Do Instead list had more well-done movies that don’t slam you over the head too much with God. We need to offer alternatives to the culture that lead them to Truth and that are appealing at the same time. Oh, and “Small Potatoes” is the title of an episode of The X-Files. I know this for reasons. Well said Erin! It’s just like teaching or parenting-When you want to encourage a certain behavior, you ignore what you don’t like (if possible) and give attention to what you do like. For instance, my dog likes treats and he has trained us to give it to him when he barks so that he’ll shut up. I didn’t say I was a good pet parent, did I? A quick mention of THAT BOOK/MOVIE as a way to enter into an in-depth discussion of better alternatives would be a great way to acknowledge what’s out there without whipping people up into a frenzy about the undesirable option. As my feed becomes NOTHING BUT rants against this movie, I wonder if people know that curiosity killed the cat. If I were a young kid following my youth minister on twitter or all these Catholic personalities, I’d be publicly in agreement…and secretly curious. Cultivate a curiosity for the good – talk about beauty! LOVE your last line especially! YES! And not just because you included two of my books 🙂 Actually, I will probably ask for your help on some sort of follow-up, inspired by you! Let me get through today’s signing first, and I’ll be in touch. I am trying soooo hard not to talk about THAT MOVIE/BOOK, because even negative publicity is good publicity, and besides, none of us who are griping about it have seen or read it, and that makes us look foolish, so I think we all need to keep our mouths shut. Just ignore it. It’s not like protesting it is going to make it go away. We just feed the frenzy. I actually don’t have a problem with pointing out the pile of poo on the sidewalk so nobody steps in it. I DO have a problem with erecting a tent over it so big that it BLOCKS the whole sidewalk. And then calling in the self-righteous news crews to have them report, “LOOK AT THIS WONDERFUL TENT THAT WE BETTER PEOPLE HAVE PLACED HERE IN THE INTEREST OF BEING HOLY!” In other words, yes, by all means, point out the bad, but then spend even more time celebrating the good. It’s like telling someone, “Don’t think of a purple elephant” without offering something else on which to fix one’s thoughts. Anyway, I’m working on some follow-up to encourage us all to accentuate the positive, etc. Yes, Fifty Shades is the triple-decker of awful. Poorly written, a vacuum of morality, and no entertainment value whatsoever on top of it. But I don’t need to hear about how awful it is anymore. I’m well aware. Thank you for this post. It was a well needed reminder that we could do something about it instead of moping endlessly about the garbage. Yes, DO SOMETHING! Check back here for a follow-up thing of which you might want to be part! That one is next on my dance card, as soon as I finish Amy Bennett’s No Vacancy. Well said Erin! I think this applies to all areas of life – stop focusing on all the negative and start highlighting the positive. We just keep breeding a society of unhappy and lost souls because we fail to teach and reinforce in the positive. Thank you so much for this! I hope you a great weekend! May I throw in my two cents’ worth regarding a splendiferous author with Oak Tree Press? His name is John M. Wills and he is the author of “The Year Without Christmas” and “Healer”. He is a FABULOUS writer! Yes, do throw in as many cents as you’d like! I trust your judgment! I recommend the Living Water series by Stephanie Landsem (www.stephanielandsem.com). 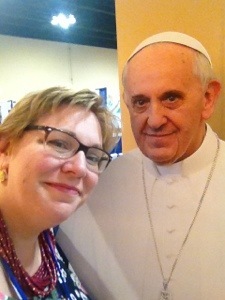 She’s just joined the Catholic Writers Guild, but I’ve been a fan of hers since her first book, The Well (a retelling of the Samaritan woman at the well), came out a couple years ago. Her third book, The Tomb (about Martha and Mary), comes out next month. I’m very excited! Thanks for the rec! These sound quite promising! THANK YOU for saying what I’ve been thinking. As a Catholic writing fiction I feel like I’ve been banging my head against the wall to get any traction among Catholic media. Yes, we have wonderful non-fiction written by doctors of the Church, Popes, and other amazing people . . . but FICTION, people . . . it’s not a bad word. This, I hear lots and LOTS of interview with non-fiction authors. WHY ARE YOU PROMOTING THE MALNUTRITION OF THE CATHOLIC IMAGINATION?!? !, is so true. Now I’ve spent the last half hour stalking you, Erin, because I so want to be your friend 🙂 And instead of reading one more rant about 50 Shades today, I’m making my list for tomorrow’s #showusyourlist. She’s in, folks! Yeah, if JPII wrote and promote fiction and poetry, then I think we can do the same to god’s glory! Amen. I was angry at first when it was so wildly popular because I felt like it would endanger women but some how the protest got all out of control and has eclipsed the good that is out there. Although it is not fiction, I’d like to add a good book to the list. My friend Jennessa Terracino just published her first book The Princess Guide: Faith Lessons from Snow White, Cinderella, and Sleeping Beauty. It is aimed at young women between the ages of 15 and 30. Hey, Erin, loved your eloquent “rant”! You have a gift for clarity. 🙂 Thank you SO much for including some of my books in your list! I am truly honored. And thanks for the link to the Litany of Humility. I’m printing that puppy out so I, too, can learn it! It is indeed a good prayer. And thank YOU for doing what you do!